Millennials are faced with tough calls at every turn. The millennials are now the largest generation in the U.S. labor force. As such, employers continue to place a large emphasis on millennials and providing resources and benefits that resonate with this key demographic. Spanning a wide age range (22 to 37 years old), millennials are in various life stages — pursuing higher education, starting their first job or climbing the corporate ladder. Yet the majority of them have one thing in common: student loan debt. Older millennials came of age and entered the workforce during our country’s most recent economic recession. Beginning adulthood during this challenging time hindered some from finding jobs in their desired fields, while others decided to pursue additional schooling in hopes of waiting out the financial downturn. This “slow start” is one reason many in this generation are still digging out of student loan debt. Younger millennials recently graduated from college and are likely feeling the hit of student loan payments that recently became a reality. Research shows that in the 2016-17 academic year, tuition and room and board at a public four-year in-state school cost, on average, $20,090 annually, excluding the cost for school supplies such as books and a computer. Because of these skyrocketing costs, almost four in 10 adults under 30 have student loan debt, Pew Research Center reported. This puts millennials at the top for the generation with the highest debt rate in history, with an average total of $30,000 in student loans. As millennials become more established in their careers and have more discretionary income, they often want to pay off their student loans as fast as possible. This often means that whatever additional income they have goes directly to paying down debt and not toward growing their retirement savings. Many assume this is the right thing to do since “conventional” financial advice used to teach us that individuals should get rid of debt as soon as they could. Although paying down debt is important, if it’s the sole focus, it can impact an employee’s ability to save adequately for retirement. Contributing to a 401(k) plan now, even small amounts, can create larger earnings in the long term due to the growth potential from compounding interest and benefits like an employer’s match. As the topic of financial wellness continues to be a priority, this presents you with an opportunity to talk to clients about the importance of educating this demographic about how to pay down student debt while saving for retirement. As you prepare to meet with clients and discuss how to reach this workforce demographic, first get yourself in the “millennial mindset.” Whether you are a millennial, have millennial children or work with millennials as colleagues, you know that student loan debt can be a source of financial stress. For some millennials, paying down their student loans comes with some emotional baggage. The thought of owing a large sum of money and the amount of time it can take to pay it off can be overwhelming. They want to get the debt off their shoulders and have the payments out of their minds as fast as possible. It’s helpful to think from this millennial mindset perspective and understand the financial stresses they may be feeling when it comes to talking about whether to pay off student loans or to put that money toward retirement. Being mindful of the potential sensitivity around this topic can help you craft your conversations about retirement savings best practices so they best resonate with this audience. When you meet with plan sponsors to discuss the importance of helping their millennial workforce balance saving for retirement and paying down student loans, highlight the need for targeted education. Retirement planning is not a one-size-fits-all approach. Work with your clients to provide retirement planning education that is targeted to the life stages that millennial participants are going through and that speaks specifically to paying down student loan debt. For the younger millennial generation, part of this education may simply focus on breaking down the common misconception that it’s better to pay off a student loan completely before investing money anywhere else. For older millennials with more discretionary income, the education should center around the value of making the minimum payments on their student loans and being more aggressive with their retirement savings strategy. This information is important to address directly with plan participants. For instance, instead of skimming over this topic in your annual meetings, provide the following insights as key parts of your presentations or one-on-one meetings. Continually addressing the challenge that millennials are facing with student loan debt and emphasizing the importance of saving for retirement can be very useful for this generation. Many participants may not realize that tax-deferred compounding is a key benefit they could miss if they are only paying off student loans. If an employee steadily contributes to their 401(k) plan, over time that money can accrue interest, offering long-term growth as it sits in a retirement account. If millennials decide to be more aggressive and pay off their student loans beyond the minimum payment, they would not have the benefit of the tax-deferred growth potential. Demonstrate the value of tax-deferred compounding with this hypothetical example. If a plan participant contributed $100 a month of disposable income to their tax-deferred retirement plan, instead of putting it toward their monthly student loan payment, they could potentially have more than $17,000 saved in 10 years (assuming a 7 percent rate of return). 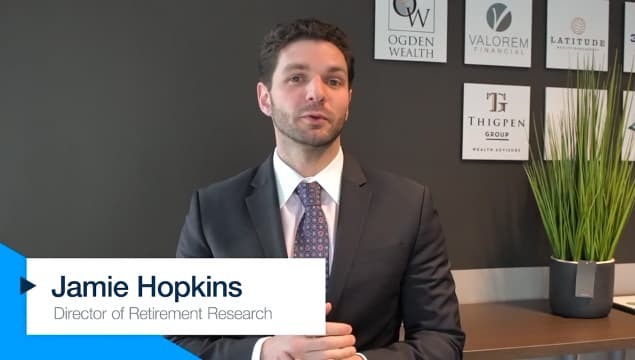 This example can help highlight the value of tax-deferred compounding and starting to save as early as possible in their employer’s retirement plan. For some millennials, putting their money toward student loan debt or toward a retirement savings account nets out evenly in their minds. Using these types of scenarios can help participants recognize that student loan repayment time is also the prime time for them to start saving for retirement. Depending on their current age, millennials could have 40 years or so to take advantage of the potential long-term growth opportunities of the stock market. Another point to make with millennials is that by forgoing saving in their retirement plan for several years, they are missing out on the employer match. They should try to at least contribute an amount that will get the maximum match. As most advisors like to say, “Not maxing out an employer’s 401(k) match is like leaving free money on the table.” Not to mention the additional savings that could benefit from tax-deferred compounding. If you are talking with millennials who were auto-enrolled, help them understand that it does not necessarily mean that their contribution rate was automatically set at a level to receive the maximum employer match. Encourage them to review their contribution rate and increase it if they are not receiving the maximum match. This is an important distinction to make and a key way this generation can be on its way to growing its retirement savings. As millennials continue to be the largest demographic in today’s workforce, there’s a great opportunity to set yourself apart by helping plan sponsors address financial well-being with their plan participants. Burdened by debt and struggling between paying down loans and saving for retirement, this generation can benefit from targeted education and industry tips on how to balance these two financial priorities. Ken Waineo is the senior director of business development and sales operations for retirement sales at The Standard.